Have you heard? The Amish are all the rage. Flip through the TV listings and you’ll find Breaking Amish, Amish Mafia, and Amish in the City. Click on the Wall Street Journal online and read the article, “Why Amish Romance Novels are Hot.” All good news considering my latest release from Harlequin Love Inspired Suspense, Plain Pursuit, is set in Amish country. Two years ago, I was at the RWA national conference when I heard a Harlequin editor say she’d love to see more Amish romantic suspense. I had long been fascinated with the Amish and I had been trying to sell a book to Harlequin. This was my chance. I just knew it. Before I even checked out of the hotel in NYC, I had an idea: What if a plane crashed in Amish country? The idea of Plain Pursuit was born. As soon as I arrived home, I started my research. I read Amish fiction, memoirs, and non-fiction books from authorities on the subject. One of the authorities is a professor who kindly answered many of my questions via email. I visited an Amish community about sixty miles south of my home outside of Buffalo, New York. I weaved my story ideas with my growing knowledge of the Amish and their way of life. I've never watched the TV shows I mentioned above because I believe they distort what the Amish are really about. However, since I haven’t watched more than the promos, maybe I’m wrong. Maybe. Amish fiction, on the other hand, tries to capture the appeal of the Amish. Country living.No car pool. A simpler time. The reality of Amish life is not exactly the same as the romanticized version in popular fiction. However, romance readers can’t seem to get enough of the quaint life of the Amish. I just ordered a new book, The Thrill of the Chaste: The Allure of Amish Romance Novels by Valerie Weaver-Zercher, a scholarly book about the popularity of Amish fiction. I can’t wait to read it. Should be very interesting. Have you ever read Amish fiction? What do you think the appeal is? I will give one random person who comments an ebook copy of Plain Pursuit (from Amazon or Barnes and Noble/US). And thank you, Susanne Dietze, for inviting me to stop by. Alison Stone left snowy Buffalo, New York and headed a thousand miles south to earn an industrial engineering degree at Georgia Tech in Hotlanta. Go Yellow Jackets! She loved the South, but true love brought her back North. After the birth of her second child, Alison left Corporate America for full-time motherhood. She credits an advertisement for writing children's books for sparking her interest in writing. She never did complete a children's book, but she did have success writing articles for local publications before finding her true calling, writing romantic suspense. Alison lives in Western New York with her husband of twenty years and their four children where the summers are absolutely gorgeous and the winters are perfect for curling up with a good book--or writing one. Random Acts and Too Close to Home were released by Samhain Publishing in 2012. Plain Pursuit, a Harlequin Love inspired Suspense, is available now. Besides writing, Alison keeps busy volunteering at her children's schools, driving her girls to dance, and watching her boys race motocross. Click here to buy for PlainPursuit! Thanks for sharing with us today, Alison! And to our guests: don't forget to leave a comment to enter the drawing to win an e-copy of Plain Pursuit! Be sure to leave your email addy in the comment! We'll draw for a winner Friday at 11:59 pm PDT. Thank you for hosting me, Susanne. Good morning, Alison! We're honored you could be here with us this morning! Hi Alison, thanks for joining us today. I have to confess that I haven't ever felt the allure that so many others do when it comes to the Amish. Your story sounds very interesting, and not as if it would paint the Amish world in the roseate glow that so many do. What about their lifestyle appeals to you? Hi Lisa! Amish certainly holds a large share of sales, doesn't it? I've always thought the Amish books I've read are a blend of historical and contemporary elements, with characters dealing within rigid societal rules and struggling with the worldliness of our culture in ways that reflect our struggles. I haven't read stacks of Amish, though. Alison, your other novels are not set among the Amish. Do you plan to write more Amish-set suspense? This sounds interesting, Alison. I love the cover. The Amish books I've read that I enjoyed gave all been suspense. And the one with the angel by Susie's friend, Ruth. I'm sorry I can't remember the title. Those all had a different twist, and I think that's why I enjoyed them. I haven't watched the shows you mentioned either. They sound like a sleazy and disrespectful slam on a peaceful people. Someone I know watches the Amish Mafia show, and from what she's told me, if it's really real, I don't understand why they aren't in jail. Sometimes when I go on the train, I see Amish people and I'm delighted to see them up close and personal. Even though I only read suspense Amish novels, I'm still fascinated by the people and their lifestyle. Good morning, Suzie! How kind of you to remember Ruth Reid's book! We used to live near an Amish community. We'd buy baked goods from them. I also was almost run over by an Amish boy riding a pony, drinking a Mountain Dew. Good morning, Alison and Susie. Thanks for the Amish info and links. Although hubby doesn't usually read Amish stories, he will if it's LIS. Most of my Amish readings so far have also been by an LIS author, Marty Perry. Love her books, Amish or otherwise. I've also read Vannetta Chapman's Amish books and her blog about Amish things. In the past, I've also gone to an 'Everything Amish' website - or was it 'Anything Amish'? to decipher some of the italicized words, but I can't seem to find that website now. There were several contributors and it was like an online Amish village with pages of information on anything Amish. Anita Mae, the whole concept of an "online Amish village" struck me as hilarious. Surely it's an oxymoron?! Thanks for the laugh, I needed it today! This sounds like a very interesting book and would love to read it. I am really enjoying reading Amish books. Congratulations for finding a great story line that worked for LIH and excited you. The Amish stories I've read have been suspense based as well, and I find your blurb very appealing! Thanks for guesting with us today! I think I understand at least the overall appeal of the Amish life, though I don't think I have the stamina and patience to do everything by hand. The book sounds very interesting. There are always fireworks when different cultures intersect unexpectedly. Anita Mae, I like Marta Perry, too. Met her at RWA last year (met=she signed my book). Her books are great. Hi Jo! Thanks so much for stopping by. You're entered into the drawing! Deb, I think the blurb is quite appealing, too! What a hook. I'm with you, DeAnna. We watched "Mountain Men" on History channel last night. One of the guys does everything by hand and/or with horsepower, meaning he uses a horse. He builds everything himself, too. I admit it: I'm too lazy. And I'm not proud of it! I think the appeal of the Amish started for me when I was a young girl. We were headed to Florida and I saw an Amish gentleman in his buggy on the side of the road. When my Dad told me that the Amish didn't use electricity, I was intrigued. My first thought was, NO TV?!? As Susanne mentioned, not all my books are set in Amish country. I do hope to revisit Amish, but I also enjoy writing "regular" romantic suspense, too. Thanks for stopping by, Suzie. I think Harlequin did a great job on the cover, too. I really haven't been drawn to the Amish "reality" shows' either. It's amazing what they'll put on TV. 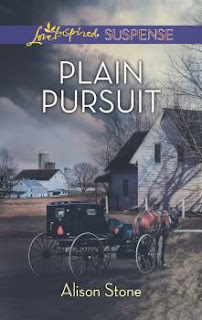 Since the release of Plain Pursuit, I've received mail from readers who live in Amish country. They tell me of hitching posts outside the Walmart!!! Surprisingly, there are a lot of wonderful blogs/websites about the Amish. I believe they are run by friends of the Amish or former Amish. I believe I'm familiar with the one you mentioned. Will I see you at RWA this year? Thanks for stopping by, Jo. Lucky for me, lots of readers enjoy the Amish books. I do have another proposal into Harlequin LIS for an Amish story. Thanks!!! And yes, do find me on social medial. My twitter is @Alison_stone . I love to meet fellow WNY'ers! I live outside Buffalo. Thanks for stopping by, Suzanne. I think you made a great point. I want to hide my phone sometimes! Hi Suzanne! I'm so glad you could come by. Your name is entered into the drawing for Alison's book! However, I will be at ACFW in Sept. Perhaps I'll see you in Indy? i love your book blurb. it sounds quite interesting. my husband and i pass through Lancaster, PA when we travel to pick up his daughter for visits. my husband watched the Amish Mafia and now we joke about seeing Levi (the "Godfather"). we doubt anything on the show is really true, but some warped version that TV editing creates. it's amazing how creative editing warps reality. i've personal experience with that. anyway, i'm glad to be introduced to another author. i would love to be in the drawing for an ebook version. i'm not a huge Amish readings follower, but that blurb would catch my attention at any time/genre. Thanks, Deb. I guess the reality shows did their job. They provided some entertainment for you and your husband. My hubby keeps telling me I should watch them for research purposes. I just roll my eyes at him! No Indy for me. We're headed to Disney tomorrow and then I'm off to RWA in Atlanta. I think I'll be exceeding my travel budget. You'll have to let me know how the ACFW Conference compares to RWA. Enjoy and safe travels. Hi DebH! Thanks for coming by. I've got you entered into the drawing! The Amish life has always interested me. My grandparents lived not far from Lancaster, PA, so I learned a lot about the culture growing up. Hi Karen! I bet you experienced a lot of Amish culture, visiting your family in Lancaster. How interesting! I've got you entered into the drawing! Thanks for coming by. Plain Pursuit sounds like a great book. I love reading anything Amish. Would love to win and read this book from a new author that I will be adding to my Amish author list. Thank you. Hi Karen G.! So glad you could come by. You're entered into the drawing for Alison's book. Congratulations, DebH! You won the random drawing for Alison's book! I'll be in touch. my copy of Plain Pursuit arrived in my mailbox just in time for my 5th Wedding Anniversary yesterday! yay. great timing! thanks again to Alison Stone and the Inkies for such generosity. i plan to enjoy the book once the toddler gets to bed.